Enterprise, NASA’s original prototype for the space shuttle program, took to the skies today for the first time in nearly 27 years for a historic sky show above the Manhattan skyline. Secured to the top of a modified 747 Boeing jetliner, Enterprise took off on Friday morning from Dulles International Airport in Virginia for New York, where it landed just under two hours later at John F. Kennedy International Airport in Brooklyn. On the way, it thrilled thousands of spectators by flying at low-attitude above some of Manhattan’s most iconic landmarks, including the Statue of Liberty, the Empire State Building and One World Trade Center, as it followed the Hudson River to the Tappan Zee Bridge and back. The spectacle is part of the space agency’s process of wrapping up the shuttle program and comes just ten days after Space Shuttle Discovery soared over the Washington Monument, White House and the Capitol before landing at Dulles International Airport in Virginia. Crowds gathered at JFK Airport in anticipation of the arrival. Spectators flocked to piers along the Hudson River, to the harbor at Battery Park and scrambled onto roof tops for the best views as the shuttle approached the skyline at 10:30 a.m.
Enterprise was chased through the air by a NASA plane and by numerous ferries and other boats zooming along the Hudson. 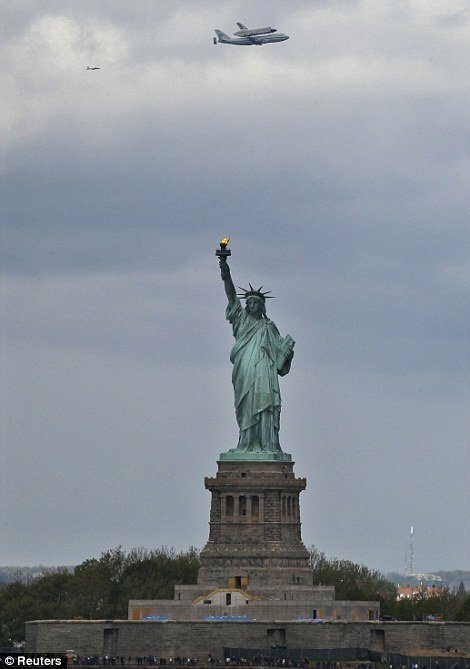 Photographs capture the moment it soared over landmarks including the Statue of Liberty and the Rockefeller Center and parts of the city, such as Long Island and Staten Island. “There it goes: Space Shuttle Enterprise flying over,” staff at the Lincoln Center tweeted. It had been scheduled to fly on Monday and then again on Wednesday but NASA pushed the journey back due to bad weather. Fears of strong winds did not deter the flight on Friday and it took off on time at 9:39 a.m.
Enterprise landed at John F. Kennedy International Airport to cheers from thousands of spectators – including school children from New York, New Jersey and Connecticut – shortly after 11:20 a.m.
“Touchdown at JFK!” NASA declared on Twitter. At the Kennedy tower, air traffic controllers had been busy fielding inquiries from pilots circling in other planes. They were told their planes would be delayed from landing because of “special activity”. Now there, it will be removed from the jetliner. In June, it will be transported by barge up the Hudson River to its final resting place – Manhattan’s Intrepid Sea, Air and Space Museum on the city’s west side. It will be “the largest and most significant space artifact in the Northeast”, according to said Susan Marenoff-Zausner, the museum’s president. Visitors viewed the shuttle’s flight across the city from a vantage point at the Intrepid, a converted aircraft carrier used in World War II. The museum also invited 1,500 special guests to see the landing at the airport, including New York state and local elected officials. Enterprise will be transported to the museum by barge in June and the museum expects to open its exhibit in mid-July. “When somebody comes to visit, they will not only see the shuttle itself, but will have an engaging and interactive experience inside the pavilion,” Susan Marenoff-Zausner told the Associated Press. NASA’s shuttle program ended last summer. After its flight two weeks ago, Discovery will take Enterprise’s place at the Smithsonian. Shuttle Endeavor will fly to Los Angeles, California and shuttle Atlantis is remaining at Florida’s Kennedy Space Center. Unlike these other crafts, Enterprise has never been used in a space mission but was a prototype used to test atmosphere and for experiments on the ground. It was rolled out in December 1976 and was crucial to the development of the shuttle program before the agency launched Discovery in 1981. Enterprise was originally going to be named the Constitution, but a campaign staged by fans of the 1960s sci-fi television series Star Trek persuaded officials to name it after the show’s fictional starship. A photograph taken shortly after shows the cast posing in front of the shuttle. While Enterprise was constructed without engines or a suitable heat shield, it did fly in 1977 – after it was mounted to the top of a NASA 747, similar to the flight it will take over New York City today. After carrying out tests throughout the late 1970s and early 1980s, Enterprise retired and some of its parts were used in other shuttles. NASA sent Enterprise on a tour of Europe and Canada in 1983. It made a brief return to service as a ground test vehicle in 1984 and finally retired in November 1985 when it was transported to Washington D.C. and became part of the Smithsonian Institution. Susan Marenoff-Zausner said the fact the shuttle has never been on a mission does not make it any less exciting. “This is an institution in American history,” she said. She believes interest in the shuttle will increase the number of annual visitors by 30%, to 1.3 million over the year. Once at the museum, the Enterprise will be hoisted by crane to a deck. The museum is housed at a 900-foot-long aircraft carrier that was used during World War II and the Vietnam War and also served as a recovery vessel for NASA’s space program. The U.S. retired its space shuttles last year after finishing construction of the $100 billion International Space Station to begin work on a new generation of spaceships that can carry astronauts to destinations beyond the station’s 240-mile-high orbit, Reuters reported. NASA has been flying the shuttles to cities around the nation for display. There had been a squabble over where Enterprise would be exhibited, with the Space Center in Houston, Texas making a bid for the shuttle. Yet NASA’s decision was based upon maximum exposure for the craft, CNN reported, meaning they were swayed by bids from New York, Florida and California.